To get the cliché out of the way early, it is nevertheless true that America is a big country. The thing is that if you come from Europe, it’s the first descriptor that comes to mind. It just seems almost incomprehensibly large, built on a different and much, much larger scale. Nowhere is that better demonstrated than at Grand Central Terminal in the city of New York, a railroad/railway station which dwarfs most others in both size and presence. It is absolutely epic in its proportions. There is considerable disagreement about its dimensions (surprising, really, considering that all you need to do is measure it), with some sources saying it is 143 metres long and 48 metres wide¹ while others give a more conservative estimate of 84 metres by 37 metres, which doesn’t feel right to me. It’s a little under 40 metres in height. You could easily fit many small British railway stations within the concourse alone. Whatever its exact dimensions, it is a cavernous space, but one full of intricate detail and beautiful decoration which makes it approachable rather than aloof. It’s world-famous, one of the few stations which stand a half decent chance of being correctly identified by non-transport industry people. 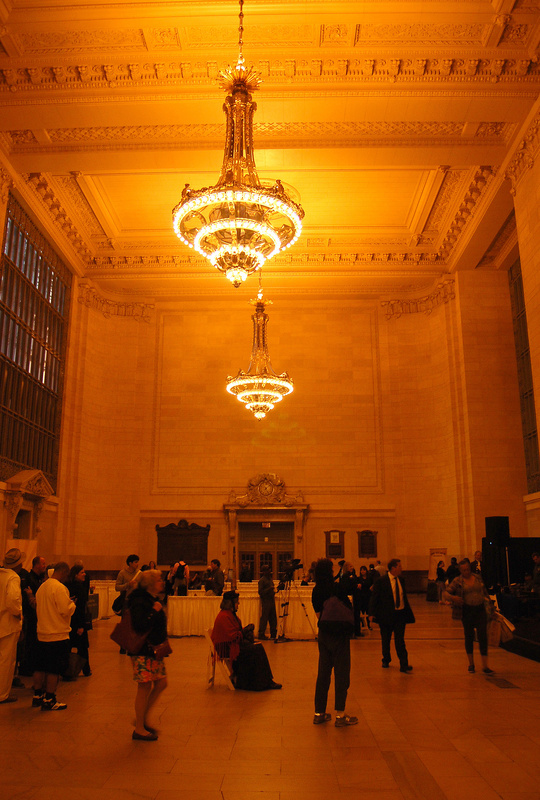 Most of the photos you see of Grand Central Terminal are of its concourse, and that is indeed the most memorable part. But the outside is a riot too. Now hemmed in by much larger buildings, the station doesn’t impose itself like it used to when it was first opened in 1913, when it dominated its local surroundings. But that was always the plan; the station was intended to spur urban development, drawing New York’s development northwards, and making the station’s developers a pretty penny in the process as they exploited the value of the land they owned around the station. The sculpture at the top, above the ornate clock, is called “The Glory of Commerce” (a more suitable subject for early twentieth century New York it would be hard to imagine), by French sculptor Jules-Alexis Coutan. The contrast with later buildings is enough to cause a sharp intake of breath, the ornate details of its exterior at odds with the lumpen ex-Pan Am Building behind. The station is actually the third or fourth version of Grand Central, depending on whether you count the rudimentary first station, and whether the very substantial rebuilding of the second station (which surrounded a great iron trainshed roof not dissimilar from the one at St Pancras in London) qualifies as an additional station in its own right. The current version of the station was designed by architecture practice Warren and Wetmore, although their appointment was not without a degree of skullduggery and scandal. A competition for the redesign of the station was won by Reed and Stem, the former being the brother-in-law of the New York Central’s chief engineer William Wilgus. This was murky enough, but Warren and Wetmore submitted their ideas after Reed and Stem had won the competition. This was at the invitation of the powerful Vanderbilt family, of whom they were friends/relations. The Vanderbilt family had at one point been major owners of the New York Central, and were developers of the previous Grand Central station; they still wielded great influence on the Central’s Board. Warren and Wetmore were invited onto the design team to work with Reed and Stem. In the event, Reed and Stem were effectively sidelined once Charles Reed died in 1911, with Warren and Wetmore becoming sole architects¹. The redesign had come about as a result of a tragic accident. In the smoke-filled tunnels leading to the previous Grand Central station, two steam-hauled trains collided in 1902. There was outrage, and the New York Central Railroad was told by the State of New York that it had five years to convert its operations in the city to electric traction (after this had taken place, the practice was for electric locomotives to be swapped for steam locomotives once trains were outside the city). The New York Central Railroad (well, mostly Wilgus) was determined to have a station which would match the nearby Penn Station, owned by its main competitor, the Pennsylvania Railroad. The conversion to electric train operations was the perfect opportunity for Wilgus to convince the New York Central’s Board to redevelop its station, reinstating long-lost roads which had been severed by the initial construction of the railroad into New York, and exploiting the air rights around the station to finance the project. 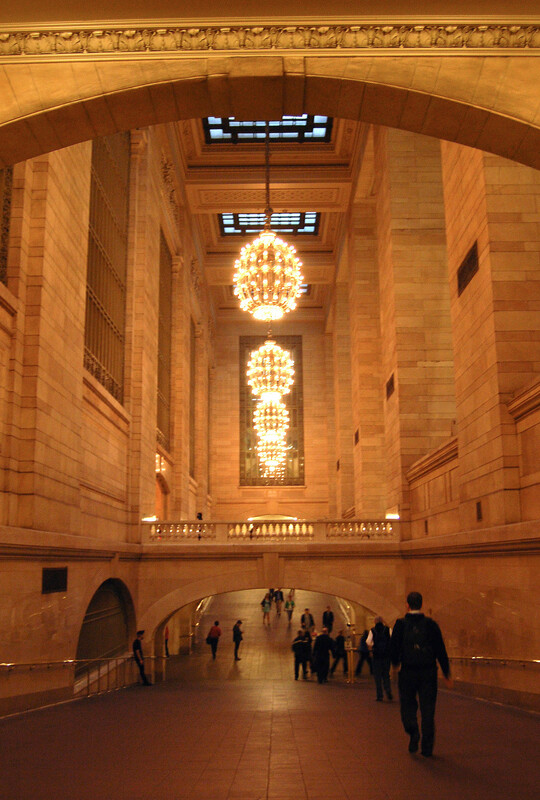 The redevelopment was intended to allow the new Grand Central Terminal to play its part in New York’s interpretation of the concept of City Beautiful, much in vogue at the time¹. 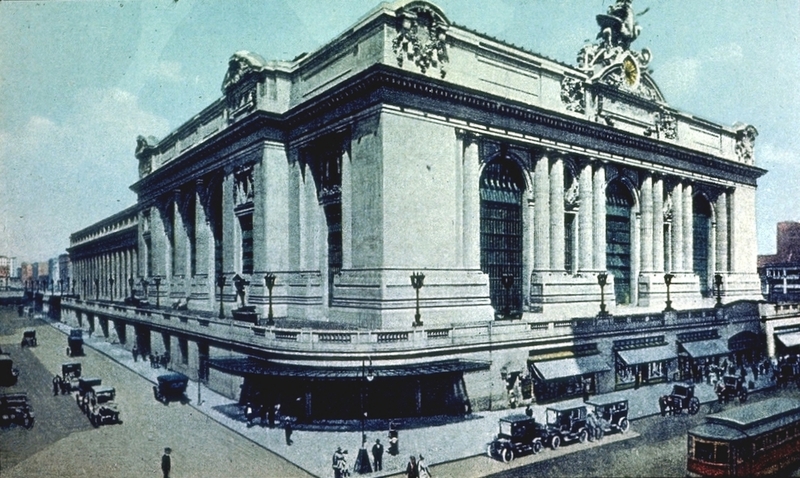 After its completion, The New York Times described Grand Central and the nearby Penn Station as, “architectural monuments of a kind calculated to illustrate and educate the aesthetic tastes of a great Nation.”¹ It is fair to say that this is a concept lost on a lot of modern transport architecture. 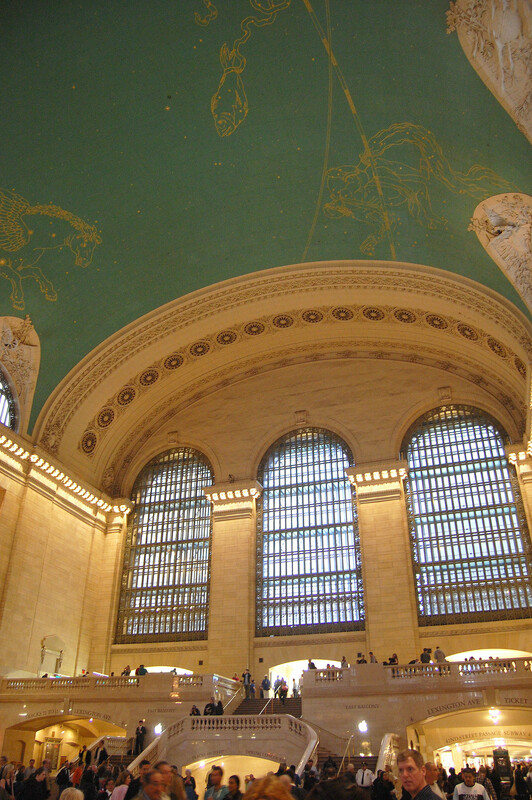 Grand Central is a truly modern station, despite its fancy Beaux-Arts architecture, and in many ways the passenger experience presaged the functioning of airport terminals¹. Because trains at Grand Central were electrically hauled, there was no need for the traditional lofty train shed roof which allowed smoke to dissipate, and the platforms were designed to be functional spaces with low roofs, which they remain to this day. They are to be found, reached via downward-sloping ramps, on the north side of the station. There are 67 tracks, and over 40 platforms serving the station (including a ‘secret’ one for use by the American President). Rather than being focussed on the platforms, the main architectural effort of Grand Central Terminal is concentrated on the concourses and waiting areas; passengers were expected to dwell there until making their way straight onto their trains at the appointed time. Concourses is no typo, by the way, because the famous concourse is the ‘Express’ concourse, serving platforms for long-distance trains. Underneath is a second concourse and another set of platforms, originally intended to serve suburban train services. It’s effectively a second station under the first. Meanwhile, Warren and Wetmore had also designed an ‘incoming’ station on the east side, separating out arriving passengers from departing ones (the former were able to avoid the main concourse altogether). If you’ve ever arrived at an airport, you’ll have experienced the same concept in action. In the express concourse, the east and west end walls have three huge round arched windows (topped with scrollwork keystones) with intricate metal frames. The longer north and south walls have lunettes set into the barrel roof, with decorative plaster work where the two meet. The grand arches at the east and west ends of the ceiling are a sculpted frenzy of floral patterning, marching across from one side to the other. The floor is Tennessee marble, with a dado of Botticino marble². Above that, what appear to be huge Caen stone blocks are actually precast plaster over hollow clay blocks¹. This is a building of artifice, of surface decoration. It is not one which uses materials honestly. This is precisely, I suspect, why so many people love it. It takes some work to admire the stark beauty of later Modernist buildings. Grand Central, on the other hand, postitively wants you to like it and goes out of its way to do so. It dazzles you with its baubles, seduces you until your head spins with the sheer dazzling intricacy of its ornamentation, and then spits you back out onto the street, or lets you stumble onto a train, dazed and confused and wondering exactly what’s just happened to you. It is, in short, the Mata Hari of the world’s great railway stations. The ceiling is painted vivid turquoise and decorated with a representation of the night sky and its constellations. This was designed by artist Paul Belleu, although it isn’t a strictly accurate representation of the night sky (and neither is it simply back-to-front as many sources will have you believe). But who cares? It looks quite, quite marvellous. As above, so below. While the night sky glitters overhead, on the floor below, crowds of commuters surge past countless stationary tourists, whose camera flashes sparkle away like the twinkling of so many novas. The station is so famous that it has become a tourist attraction in its own right, something to see, to capture on film or memory card. Taking photos at most railway stations attracts the attention of security guards in case you’re planning some criminal enterprise. Here, it would be pointless. There are too many cameras, and it’s almost more surprising when people don’t stop to take photos of this most photogenic of concourses. The two banks of ticket offices along the south wall of the concourse are original, and full of beautiful detail. Brass scrollwork grilles cover the ticket office windows and triangular lampshades of white glass hang from ornate supporting arms. The ticket offices are still used for ticket sales, as you can see from the photo below, though not all of them are now needed given today’s levels of automatic ticket retailing. 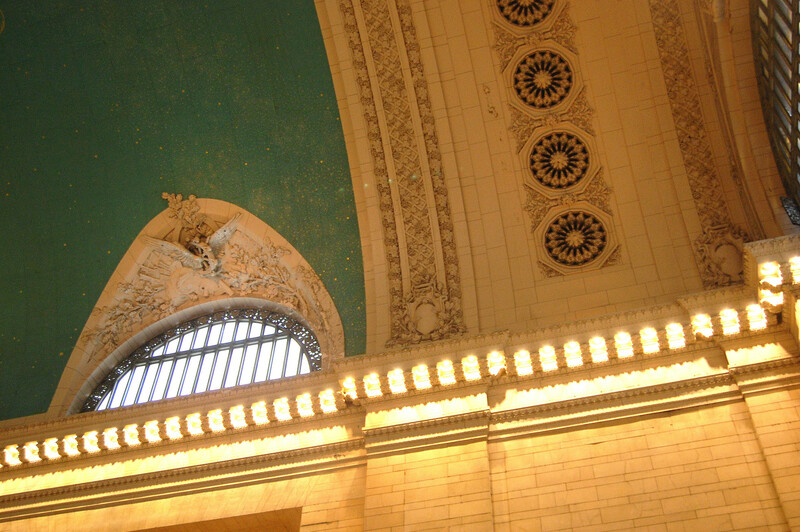 In the middle of the concourse is a circular information desk, topped by the four-faced spherical clock which has become just as much an icon of Grand Central, as Grand Central has become an icon of New York. The information desk is linked to another one in the suburban concourse, directly underneath, by an internal spiral staircase. To the south of the main concourse is the waiting room, reached through the gap between the two sets of ticket offices. Room, I ask you. It’s a huge hall which dwarfs the main buildings of most British railway stations. Now used for exhibitions and events, its tiered electric chandeliers are especially notable. Between the waiting room and the main express concourse is a set of wide ramps leading down to the suburban concourse, crossed by a bridge linking the waiting room and express concourse. It’s yet another astounding space in a series of such spaces, and lit by even more eye-boggling light fittings, hanging from square skylights high above. The suburban concourse is less obviously dramatic, with its much lower ceiling and lack of windows (being under the ground). Yet even here there is much to admire with decorative cornices all round, intricate grilles in square pillars, and beautiful finishes to the floors and walls. It is now the home of one of the best-located food courts anywhere in the world. 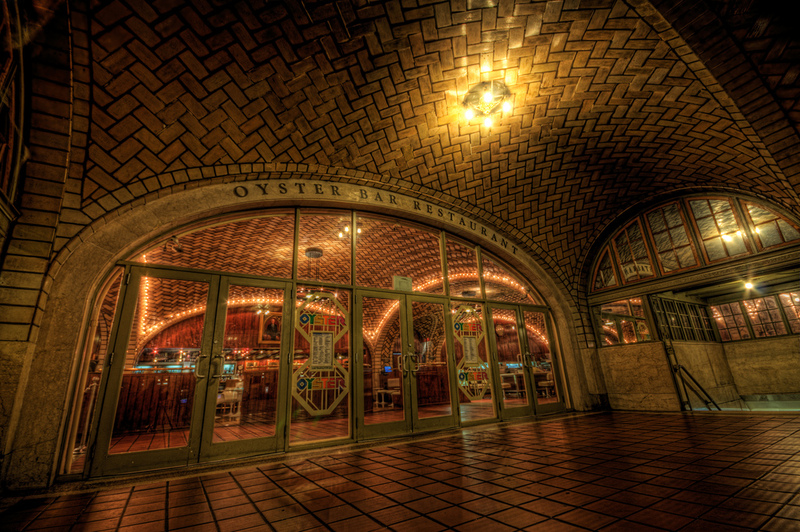 The jewel of the crown down here, however, is the Oyster Bar, which is separate from the concourse’s newer food court. Its fabulous vaults are covered in Gaustavino tiles. The current state of station is the result of a long, hard slog of restoration. As long distance train travel collapsed in America during the 1950s and 60s, Grand Central Terminal fell into a slow decline. Insensitive developments and advertising hoardings were allowed to spoil the interior. The station was threatened with demolition but New York’s heritage lobby was smarting from the loss of Penn Station in 1963 (it was rebuilt underneath Madison Square Gardens as a disorientating humid basement, a location seemingly designed for chaos and confusion). There was a determination not to let the same thing happen again without a fight. 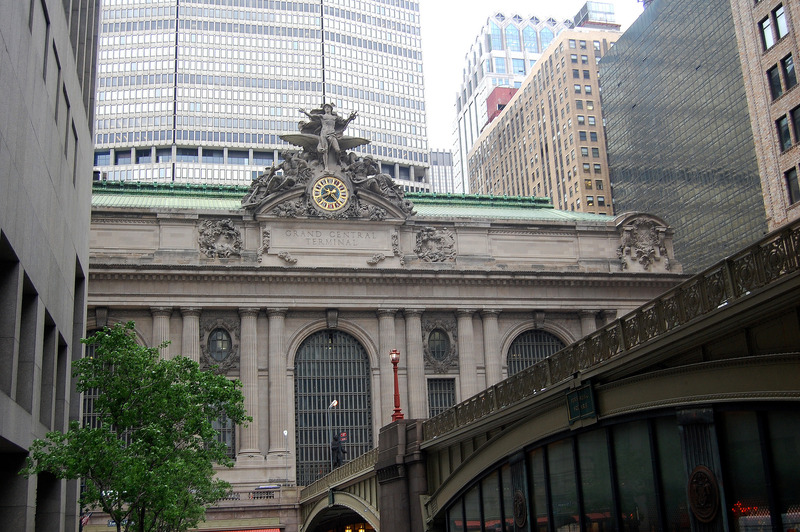 That fight went to the U.S. Supreme Court before Grand Central’s designation as a landmark was confirmed and its future assured. 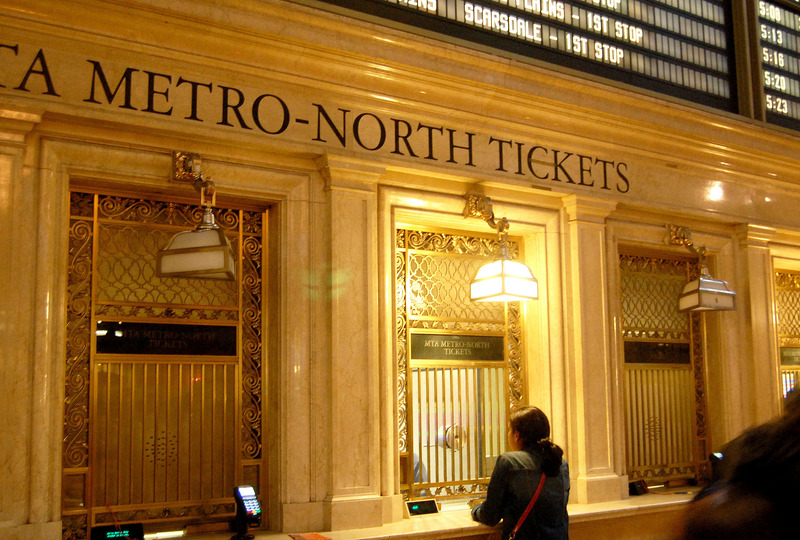 Despite its fame and its history at the heart of the New York Central Railroad’s nationwide network, Grand Central is today used solely by New York’s Metro-North suburban railroad (which took over the station in 1982). The long distance express trains which used to run west across America are now based at Penn Station. Thankfully Metro-North appreciated the asset it had on its hands, and has masterminded the restoration of Grand Central to its current glorious condition. It is still used, and is here to stay, and the Long Island Railroad is being extended from the west side of New York to a new station under Grand Central, due to open in 2020². 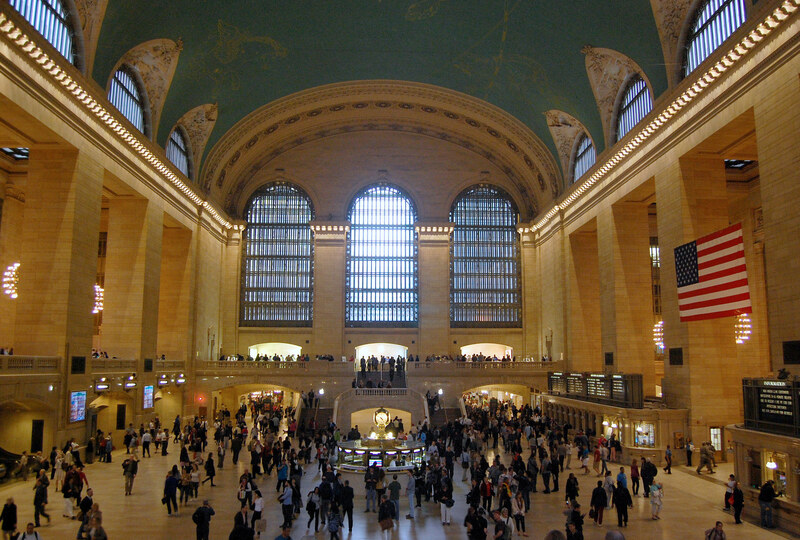 In the meantime, Grand Central Terminal forms the most impressive of welcomes every day for thousands upon thousands of Metro-North commuters to New York, New York, the city so nice they named it twice and gave it one of the world’s greatest railway stations. What a lovely concourse, but such a shame the overall effect is spoilt by the hanging of a flag.